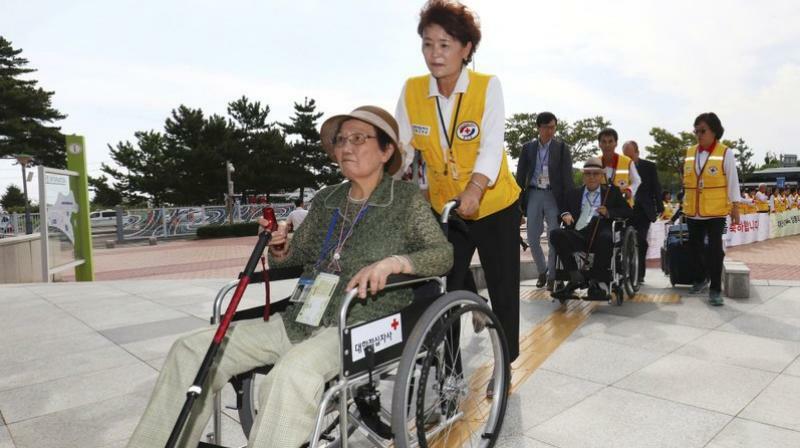 Seoul: Dozens of elderly and frail South Koreans entered the North on Monday to meet relatives for the first time since the peninsula and their families were divided by war nearly seven decades ago. The three-day reunion, the first for three years, will take place at Mount Kumgang, a scenic resort in North Korea, following a rapid diplomatic thaw between the neighbours. Hostilities ceased with an armistice rather than a peace treaty, leaving the two Koreas technically still at war and the peninsula split by the impenetrable Demilitarized Zone (DMZ), with all direct civilian exchanges, even mundane family news, banned. The 89 ageing South Koreans, dressed in their best suits in the scorching sun, hobbled one by one to 14 coaches in Sokcho, wheelchairs alongside the vehicles, some excited with others in disbelief, before the convoy set off, escorted by police and medical personnel, and later crossed the DMZ into the North. "I never imagined this day would come," Lee said. "I didn't even know if he was alive or not." More than half the survivors are over 80, with this year's oldest participant Baik Sung-kyu aged 101. "I also brought 20 stainless spoons," he added. "I bought everything because it's my last time." Some of those selected for this year's reunions dropped out after learning that their parents or siblings had died and that they could only meet more distant relatives whom they had never seen before. But Jang Hae-won, 89, who fled their hometown in Hwanghae province along with his older brother, said he would meet his nephew and niece to offer them a glimpse of their father's life. "They don't know what their father looks like so I will tell them what he looked like and when he died," Jang said. "But that's it, because the more we talk, it will only be more sad." The North's leader Kim Jong Un and the South's President Moon Jae-in agreed to restart them at their first summit in the DMZ in April, and the two Koreas have discussed cooperation in various fields at a series of meetings between officials. Lim Eung-bok, who is meeting his brother and his family, said: "I have so many things I want to say but there are a lot of restrictions."